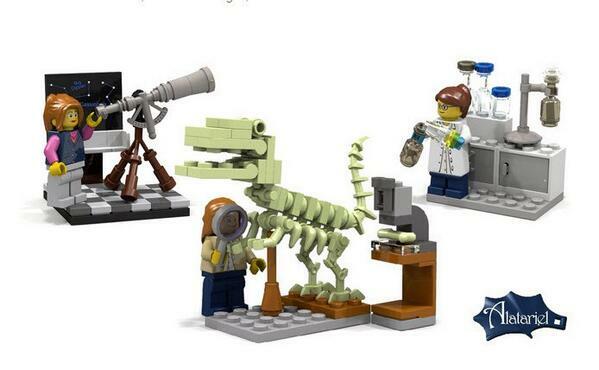 And it’s all LEGO… – Justyn Barnes Media Ltd.
A small step for (plastic) womankind: the new, aspirational, science-themed ‘Research Institute’ set is a welcome addition to the LEGO range. So, the first of my two major seasons of LEGO copywriting is drawing to a close. Over the past three months, I’ve written sales copy for precisely 96 products across 13 different product lines, ranging from Architecture and Super Heroes to Ultra Agents and The LEGO Movie. Each product text consists a product number, product name, description, headline, SEO one-liner (140 characters only) and bullet points, totalling 150-250 words. Having written between three and six drafts per product line to gain approval by the relevant LEGO marketing and design departments and then Legal (and in some cases an external IP holder), my source copy is now being translated into over 30 languages. This process is handled by TextMinded http://textminded.dk/, the Danish agency I work for, who organise most of LEGO’s copywriting, translation and transcription (that is, making sure copy reads smoothly in every language after translation). When the products are launched in the first half of 2015, my copy will appear on over 50 major etail websites (Amazon and Toys R Us etc) worldwide. At the start of July, myself and the rest of the TextMinded’s team of freelance copywriters will receive briefs for loads more ‘2015 2HY’ products. Funny to think that my LEGO work is by far the most-read text I will ever write, viewed by millions of people who would have no idea who wrote it. If only I could write a book that attracts that kind of readership… Hmm. Actually, while producing the LEGO texts this year, I’ve also been researching and writing an official Downton Abbey book for Headline Publishing (first draft recently submitted – more of that in a future blog…) among other things. Working simultaneously on two diametrically different projects has suited me well, allowing me to flip from one to the other as and when I feel suitably inspired. Although LEGO sets are predominantly aimed at young children, the process of writing the copy is actually quite technical, with a detailed style guide to follow to ensure that the copy written by myself and other members of the team has a consistent feel and structure. Certain product lines have additional style rules which have to be adhered to. The skill is to be imaginative and write copy that grabs the attention of the reader within those guidelines. This is my second year of writing for LEGO, and now I’m more familiar with the style sheet and what the different marketing teams are looking for, it has become easier. As the article says, it’s ‘one tiny, plastic step forward’, but a very welcome one, and I expect it to be the first of many. And ‘The Art of the Brick’ exhibition is coming to London… hooray!